Filled with emotions and new ideas – that is the signature feature of the concept cars from Swiss car visionary Frank M. Rinderknecht that have added colorful bright spots to the Geneva Motor Show for many years. Rinspeed boss Rinderknecht always has a surprise up his sleeve and this year is no different. Once again he does what nobody would have expected from the whiz kid known in the past for his affinity for powerful machines: He’s building a subcompact car. But that’s not all: For the first time in the long history of its concept cars the Swiss automobile and concept powerhouse has developed not just a vehicle but an entire mobility concept. The cute two-seater with electric drive is aptly called the “UC?” which stands for “Urban Commuter.” But the biggest surprise is that the “UC?” was designed to be ready for future series production. The little speedster measures less than 2.60 meters in length and is intended to help avoid gridlock in the inner cities. At the same time an advanced railcar loading system will add the option to cover long distances by train, comfortable, without traffic jams and stress-free. The goal is to create a new mobility concept that integrates individual car ownership and public transportation. A transverse loading system using custom railcars allows loading and unloading of numerous “UC?” vehicles simultaneously and in a very short time. Train passages are booked and reserved online directly from the vehicle. Harman International provides the permanent 3G internet connection as well as marvelous sound on wheels. VoIP2Car technology provides IP telephone service, video chat, video conferences, e-mail and many more features in the “UC?”. Integrated charging stations on board the custom railcars ensure that upon arrival at the destination the “UC?” battery is once again fully charged for maximum operating range. During the train trip drivers can visit the train restaurant, use any of the other train amenities or spend time in the privacy of their cars. With this mobility concept Rinspeed elegantly circumvents the obstacle of limited operating range that so far has kept many interested parties from switching to zero-emission vehicles. As Frank M. Rinderknecht sees it: “I can make more efficient use of my time than spending it driving on a boring highway. I’d rather visit the train restaurant or retreat to work in my car.” The Swiss visionary is already in discussions with international railroad companies about his new mobility concept. 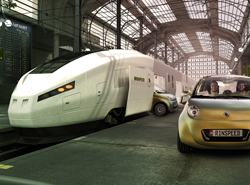 As in past years, the concept car was built by Swiss engineering company Esoro. The lightweight vehicle produces 130 Newton meters of torque, reaches a top speed of 120 km/h and has an operating range of 105 kilometers. That is more than enough for most traffic in urban areas. Statistics show that in Europe 82 percent of all trips cover distances of less than 60 kilometers – short-distance driving clearly represents the vast majority of all individual traffic. 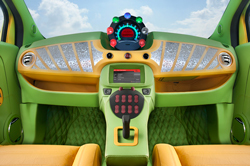 The “UC?” also features a number of technical highlights: Goodbye steering wheel, hello force-feedback joystick. The new joystick technology is supplied by German electronics specialist Rafi. Rinderknecht says: “Forget everything you have learned about joysticks so far. Finally this system provides a better steering feel and clear feedback from the road.” The entire car is operated via Space Drive, a drive-by-wire system developed by Paravan, one of the leading manufacturers of handicap vehicles. Rinspeed and its partners had to master numerous challenges surrounding the electric drive system: The lithium-ion batteries come from Li-Tec-Battery in Germany, a joint venture of Evonik and Daimler AG. The efficient and reliable on-board charger is supplied by specialist Absaar; the external stationary charger comes from ABB Sécheron. Axpo Holding is yet another energy company that partnered with Rinspeed on this project. The electric heater and sphere-shaped vents were installed by the specialists from Eberspächer. Rinspeed also received support from the consortium Swiss Coop, which promotes decisive action and zero-emission mobility, and from the power plants of the Canton of Zurich that provide electricity and the required infrastructure. To save as much energy as possible the developers have placed highest priority on lightweight design: Ticona, one of the world’s leading manufacturers of engineering polymers, plays a major part in achieving this objective. The lightweight lift gate comes from Rehau, an OEM supplier for the automotive industry. The P7 Cinturato ‘Green Tires’ from Pirelli in size 195/40 R 17 are mounted on special lightweight rims from German-Austrian manufacturer AEZ. The delicate-looking rims weigh just 6.2 kilograms each. Eco-friendly lubricants are provided by Motorex. And of course the electric “love bug” has a number of features that will stir up emotions: An immediate eye-catcher is the paint that changes color from yellow to green. The paint was supplied by Akzo Nobel, one of the world’s largest paint manufacturers. A new adhesive paint called “Stickerfix” is perfect for touching up minor cosmetic paint blemishes sustained on the road. The jazzy leather interior including aluminum inlays and a custom leather suitcase for the roof come from specialist Sellner Group. VDO Continental Automotive has designed a new futuristic instrument cluster for the “UC?” The new cluster also houses a Swiss-made mechanical watch from Swiss premium manufacturer Carl F. Bucherer. A beautiful crystal ‘tank lid’ from Swarovski covers the necessary 230-volt plug. A stylized laser-cut coil filament embedded in the crystal lid serves as a battery charge indicator: red=empty, orange=half charged, green=fully charged. 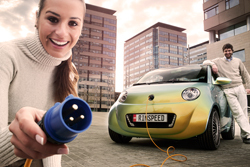 Rinspeed wants to change the electric drive’s image: The “E” signifying the electric drive isn’t shamefully hidden but displayed openly and proudly: “Look here, I drive with electric power”. The “UC?” is designed to be available in several distinct versions: The “Ultimate Commuter” is the comfortable lifestyle vehicle for urban commuters. The vehicle of choice for pizza deliveries, mail carriers and workmen in general will be the “Unlimited Commuter.” The experts from renowned A.T. Kearney Consultants designed the modular production strategy to ensure that the car will be built as cost efficient as possible. The ultimate goal is to serve many different types of use and configuration variations: It will take just three days to build an electric car. There is a good chance the “UC?” will enter series production. The concept is designed be easily adapted and integrated by volume manufacturers. Intensive dialogues at the highest levels are already well underway. 11 maart 2009: Rinspeed had in Geneve nog een primeur, de Rinspeed Exasis, helemaal gemaakt van clear plastic Makrolon(r). Daarnaast werd er meer zichtbaar van de al lang geleden aangekondigde Rinspeed iChange. 13 januari 2009: Zo, we zijn weer een jaar verder en de Geneva Motor Show van 5 tot en met 15 maart 2009 komt alweer in beeld. Rinspeed is er weer als de kippen bij om als één van de eersten weer een opmerkelijke conceptcar aan te kondigen met de heel mooi gehusselde naam iChange. Na de onderwaterauto, zit de trick nu in een soort metamorfose. De iChange kan als één-zitter worden gebruikt, maar met een druk op de knop, verheft de achterkant van de iChange zich, zodat er plaats komt voor extra passagiers. De iChange is voorzien van een sterke elektromotor en is zo licht mogelijk geconstrueerd en er is veel gedaan aan een lage luchtweerstand. Bron: Rinspeed. 15-01-2008: De sQuba is een conceptcar van autobouwer Rinspeed, voor het eerst te zien in maart op de Geneva Motor Show. De gelijkenis met de Lotus Esprit die James Bond in A Spy Who Loved ook kon transformeren naar een duikboot valt direct op. Suffering extreme traffic congestion, the number of people using cars to commute is increasing. The exhaust from vehicles causes serious air pollution and deteriates the supply of fossil fuel. The next generation car should be a complete electric vehicle over the hybrid concept by using sustainable energy sources. E-Commuter uses two kinds of cells. Using Photovoltaic power generation to charge the upper solar cell, and the insufficient energy of E-commuter can be supplied by Outer-battery. The outer-battery of E-commuter can easily attach/detach and be moved because of the wheels. E-commuter uses its outer-battery when you are in long-trip or it cannot generate energy so much because of the low amount of sunshine. The wheels of E-commuter uses the theory of repulsive-type maglev float by using the magnetic power. The wheel has no friction, it absorbs vibration and makes the electric-efficiency better. Thin slick tires aimed at the bicycle using 700c wheels show great energy efficiency in traveling through urban districts. The commuter car doesn’t need to go over 120mph speed or 300 horse power. The Commuter Car is silent, has no emissions and can run leisurely. The more E-Commuter runs, the city filled with noise and smoke will turn to the more walk-able place.